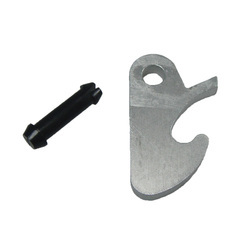 The tilting hook and pin for the British Seagull® Outboard tilting mechanism found on the Forty Featherweight and Forty Plus outboard engines. The British Seagull® Outboard tilting hook and pin is fitted to the engine tilting mechanism on the support lug on the Forty Featherweight and Forty Plus engines. The hook needs to be fitted so that it will locate over the top stud of the transom bracket. This part is suitable for Forty Featherweight and Forty Plus British Seagull Outboard engines including SJM, F, GF, FS, GFS, EFS, EGF, AF, EF, SEF, TSEF, SJP, FP, GFP, FPC, GFPC, EFPC, EFPW, AFPW, EGFPW, AFPC, SEFPC & TSEFPC engines.